A new rapidly growing, community oriented exercise gym, CrossFit, has developed its own multi-million-dollar slice of the fitness industry on the backs of all-star athletes, elite armed forces, and power moms. “Oh, F**k!” huffs a tree trunk of a man, whose hunched, sweat-drenched body looks like it was just tossed out of a professional wrestling match. I feel naively sympathetic, since I don’t realize it is now my turn with the same workout. At CrossFit gyms, everyone does the same drills, from expectant mothers to Navy SEALs. During my four-month experiment with the growing exercise brand, I learned that CrossFit proposes that elite athleticism and seemingly impossible workouts can be survived with a little help from supportive peers pushing each other through the pain. Group workouts pack the most functional movements of Olympic lifting, gymnastics, and calisthenics into a 10-to-20-minute sprint. The routines are slowly creeping their way into the regiments of all-star athletes and armed forces divisions around the world. They’ve put me in the best shape of my life. 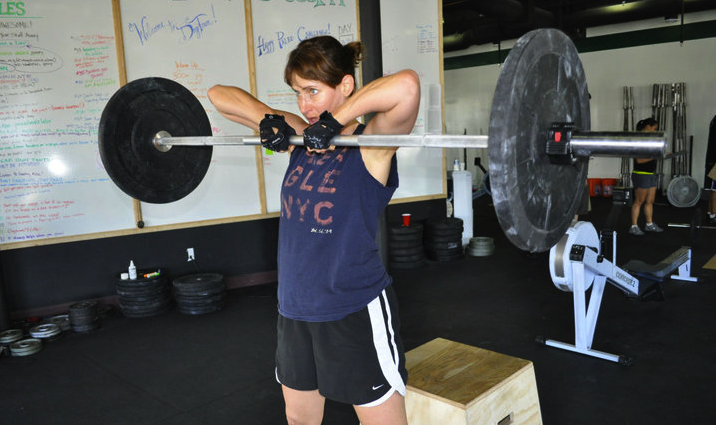 The community spirit of CrossFit seems to organically foster a sense of whole-body wellness. The local nutritionist at my CrossFit gym (DogTown) coordinated a gym-wide diet plan (putting me at my lowest body-fat percentage ever) and a fellow gym member and USC-trained physical therapist casually diagnosed my decade-old shoulder condition (side benefit to the social aspect: CrossFit DogTown owners Dusty Hyland and Liz Arnold also mustered their community together to raise $50,000 for a cancer charity drive, driven by their personal connection to victims of cancer). Once the cult sensation of a few Santa Cruz, California, enthusiasts, the decision to place daily workouts on the Internet catalyzed its exponential growth, with a quickly expanding community of blogs by nutritionists, physical therapists, and niche styles. Affiliate gym growth went from from 49 worldwide in 2001, to roughly 500 in 2008, finally ballooning to its current size of 2,800, according to a CrossFit spokesman. As a result, a cottage industry of CrossFit-focused businesses, from premium jump rope manufactures to apparel, have thrived throughout the recession, with at least one multi-million business, Again Faster, growing revenue at over 1,400% in three years. “There’s no question we think CrossFit is going to be bigger,” says Matt O’Toole, Chief Marketing Officer at Reebok, which just Inked a 10-year exclusive deal on all official sponsorship, and designed an array of CrossFit-branded apparel. At traditional gyms, “A guy will work out for an hour and do nothing functional, nothing that has an analog in basic movements,” jokes CrossFit founder, Greg Glassman, “There’s nothing that happens on a job site that looks like this,” he says while miming a bicep curl. That is merely the warmup. Weights are deliberately scaled for smaller women and newbie couch potatoes. They perform push-ups with knees on the ground, do pull-ups scaffolded by elastic bands, and lift skinnier Olympic bars. “It’s pushing your specific capacity,” says Liz Arnold, who sees a benefit in mixing skill levels. “You’re motivating each other, as a community.” At DogTown, when members were seen struggling through a difficult workout, everyone would stop what they were doing, encircle them, and cheer them on. “CrossFit is what I was always looking for,” says Santa Monica SWAT team member, Scott McGee, whose relentless evangelizing is quickly winning over his colleagues, growing from three CrossFitters on his force to 50 in “few” years. As a result, at their bi-annual physical test, “everyone on the team, including sergeants, has to pass Murph,” one of CrossFit’s most grueling WODs. CrossFit, however, bills itself as a movement bringing elite athleticism to any demographic. 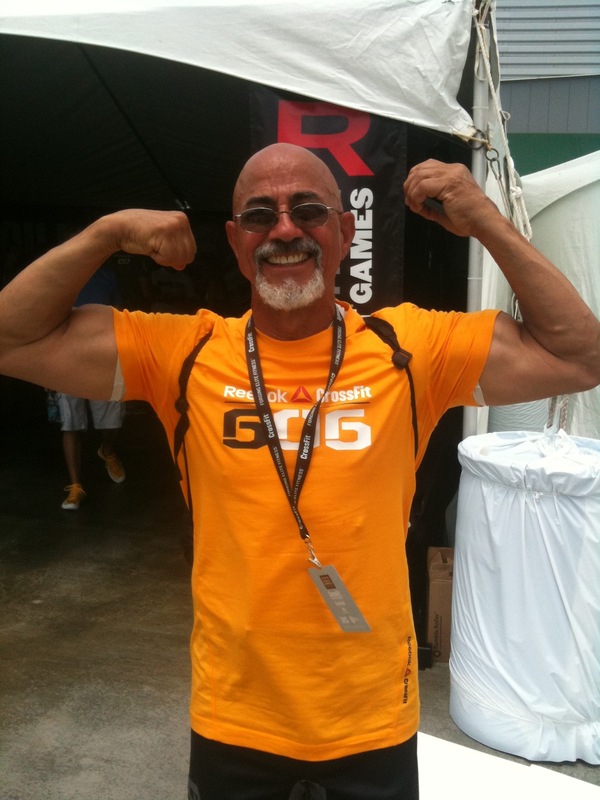 “Right now, I believe I’m in better shape that I’ve ever been,” says 72-year-old Jacinto Bonilla, the oldest competitor at last weekend’s CrossFit Games‘ Masters division, for +40-year-olds. 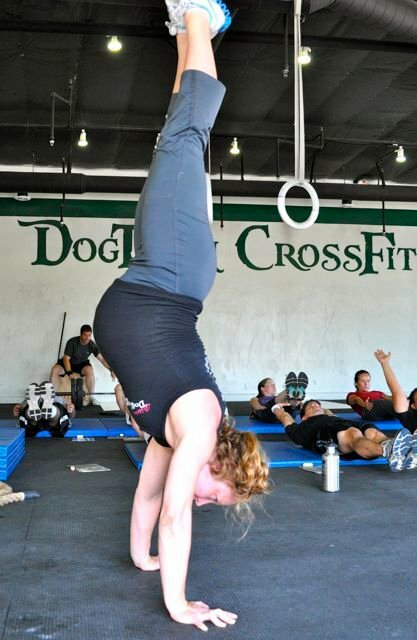 “I think CrossFit can be for everyone,” says Val Voboril (who is pictured in the handstand, 9 months pregnant, below). “It made my pregnancy easier,” she contends, as the “strength, conditioning, and endurance,” helped her deal with the added weight of carrying another human being. Prior to CrossFit.com, Glassman’s program was a tiny cult sensation in the lazy beach town of Santa Cruz, Califonia, where he began training clients in a functional workout program. The company’s primary revenue stream, licensing entrepreneurs to start CrossFit gyms (for what is now a $3,000 annual fee), had only a few adopters, mainly from Glassman’s friends who he says begged him to start an affiliate program. Additionally, he says, the new blogging trend allowed recently deputized zealots to write about their experiences and pull in fellow fitness enthusiasts from their network. Today, the Internet is sprawling with CrossFit blogs, some from official affiliates, and others from specialists who post their expertise for free. “The more you give away for free, the more you thrive,” says clinical physical therapist, Kelly Starrett, founder of MobilityWOD.com, a daily video blog on improving range of motion, injury prevention, and flexibility (one of the blogs I now follow daily). Starrett’s, whose blog has seen 3.5 million views since he began posting free daily lessons 9 months ago, says that giving away information has boosted both his reputation and personal practice, including an invitation to speak at Google HQ. “Here are the recipes, but you’re still going to come to my restaurant,” he explains. In my own experience, the more regular impact of the Internet was Facebook and Twitter updates from DogTown’s social media accounts–pictures of strenuous workouts or post-workout group photos. CrossFit is a premium sport–much to the detriment of my bank account. Membership dues are $200 a month–a piggy-bank-smashing five times more expensive than the traditional gyms peppered around my apartment. My already health-packed grocery bill more than doubled, largely due to the swelling volume of protein products overtaking my fridge (most gyms strongly encourage members to abide by the Paleolithic dietary guidelines). But, what makes my bank account weep also makes CrossFit entrepreneurs sing: Gilson estimates that the average gym owner can rake in $135K a year, with 125 members at $150/month and $90,000 in overhead (owners also make money on merchandise, private lessons, and food supplements). There’s even enough momentum to support smaller niche suppliers, such as RX Jump Ropes, which specializes in helping athletes perform only one of CrossFit’s many common moves, a rope jump that passes twice under the feet before landing (“Double Under”). “This was an accidental business,” says David Newman, who got caught up in the unexpected upswing of CrossFits’s growth thanks to his personal friends who spread word of his product. Gilson says it remains to be seen whether outsiders can muscle their way into to the close-knit economy. Indeed, every business I spoke with, including the largest industry supplier, Rogue Fitness, were all founded by CrossFitters. As for me, I’m taking a break from CrossFit, but plan on returning–I don’t want to completely let go of my new six-pack.